Some days are better than others. 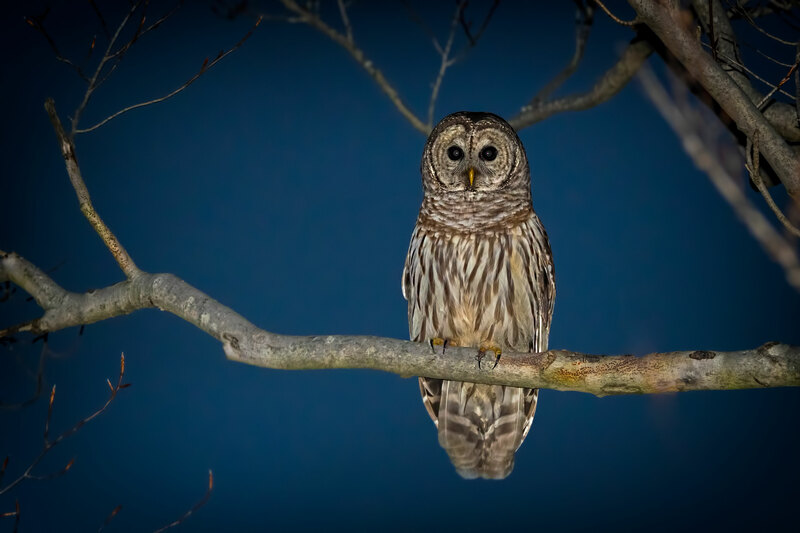 Today was one of the better days, because it ended with a Barred Owl flying into one of the trees behind my house. The weather today was unseasonably warm, and I was on my upper deck watching a gorgeous sunset when the Barred Owl flew into the tree. I quickly went inside and grabbed one of my cameras and took a couple of shots, but the owl was only a silhouette against the early evening sky. I quickly went back into the house and mounted a speedlight (flash) on to the camera and returned to the deck. Fortunately, the owl was still in the tree. I managed to get off a few shots before it flew away. What a great way to end a weekend! The above image was taken with a Nikon D810, Nikon SB-910 Speedlight, 80-400mm lens at 200mm, f/5.3, 1/500 sec and ISO 800. This entry was posted in Lake Montclair, Nature, Wildlife and tagged Barred owl. Bookmark the permalink. I’m not a photographer. However,if I were, I would be jumping up and down with excitement.To have captured a magnificent bird of prey with such clarity and peaceful countenance is a rare occasion.can I buy it? Such an amazing visitor that you had.